We have Just Sold out of Star Wars Imperial Symbol Lapel Pin. Not to Worry! Fill in the Notify me When Available and you will be the first in line for our restock of Star Wars Imperial Symbol Lapel Pin !! 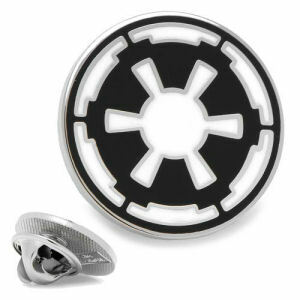 From the Star Wars collection by Cufflinks Inc.. Star Wars Imperial Symbol Lapel Pin. Measures approximately 0.75 inches in diameter and features silver plated base metal with enamel finish and clutch back closure. Officially licensed by Lucasfilm LTD.